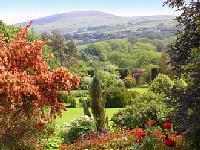 The 6.5 acres of gardens overlook the Preseli Hills and are perfect for gardeners, artists, photographers, birdwatchers and wildlife enthusiasts.Yvonne and David aim to provide a peaceful haven where visitors are able to leave the 21st Century behind and contemplate the bounty that Mother Nature has to offer. The large range of plants and long seasonal interest will stimulate the senses at any time of year. The Tea Room, which has been awarded the Pembrokeshire Produce Mark, is set in a converted 300 year old barn and offers a selection of home made cakes and scones at pretty tables set with bone china. It has an entry in the prestigious Margaret Thornby's Tea Rooms of Britain Guide. In fine weather tea can be taken outside on the patio overlooking the gardens and the hills. On the B4332 between Eglwyswrw and B0ncath to the west of the A478.